Coventry Airport could be transformed into a distribution hub to bring over 600 jobs to the area, under new plans. The Baginton site is set for a complete rejuvenation with plans to transform the abandoned passenger terminal on the airport’s south side, currently only used for aircraft parking. Airport owners agreed to sell off 30 acres of land to Ostrava Property to carry out the work which would spell the end for the future of passenger services from the site. But the plans would need approval from Warwick District Council planners before going ahead. The site, which was once a thriving airport, has been largely unused for over seven years after the last passenger flight set off in November 2008. It was taken over Sir Peter Rigby under the Rigby Group two years later and continued to offer freight and private aircraft services. Rob Sweeney from Coventry Airport, said after being abandoned, it made sense for the defunct land to be given a new lease of life as an economic asset for Coventry and Warwickshire. “With the closure of the passenger terminal and associated buildings on the south side of the airport at Middlemarch, the land is redundant for aviation purposes,” he said. The upgrades will replace vast concrete space and former temporary housing for passengers, creating a “modern manufacturing and distribution hub” in its place. It is not yet known who will occupy the space, but planners estimate the change will create up to 600 jobs. Coventry Airport ran commercial flights to Europe until 2008 when Thomson pulled out of the city. The commercial airport closed down a year later. Peter Burns, chair of the Coventry Airport Consultative Committee, said: “We welcome this news. 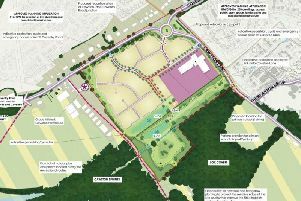 There is no question that Coventry Airport is a considerable economic asset which brings investment and employment to the area, and this proposed development is another example of that. Andrew Cox from of Ostrava Property which was formed under the Rigby Group to deliver the project, said: “It’s a win-win situation. The land is owned by Coventry City Council and leased to the current management. Coventry City Councilor, Cllr Kevin Maton said with a “real and urgent need” for land in the area, the announcement was good news for future growth.